1st Lt. Charles “Pop” Rice Jr. In elementary school I loved to read books and was a big fan of the Bantam paperback military histories. I recall my mother would take me to a book exchange where I could trade in paperbacks that I had read for ones that I had not for a nickel. 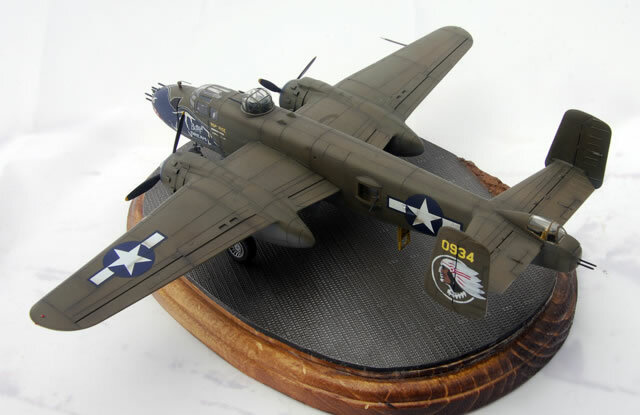 One of the books that fired my imagination was Martin Caidin’s Whip, about a rag-tag unit of B-25 Mitchell bombers that stops retreating in northern Australia long enough to pack the nose of their bombers with .50 caliber machineguns and turn the tide against the Japanese with a swath of lead and skip bombing. The book was a heavily fictionalized account of the 345th BG “Air Apaches” and their mad genius, “Pappy” Gunn who developed the B-25 gunship and helped master skip bombing on the SS Pruth wrecked on Nateara Reef south of Port Moresby in New Guinea. Reading the book now, you quickly realize that Martin Caidin would never be confused for Bill Shakespeare, but for a young kid sitting in the back of his grade school class it was brilliant stuff…and created a lifelong love for the homely B-25 Mitchell and the 345th Air Apaches. 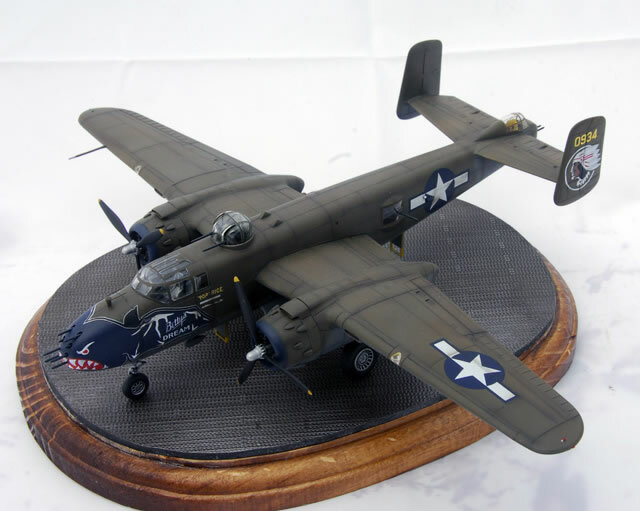 In 2003, Hasegawa came out with a new-tool series of North American B-25H/J Mitchells in 1/72. The reviews were positive for just about everything but the price. 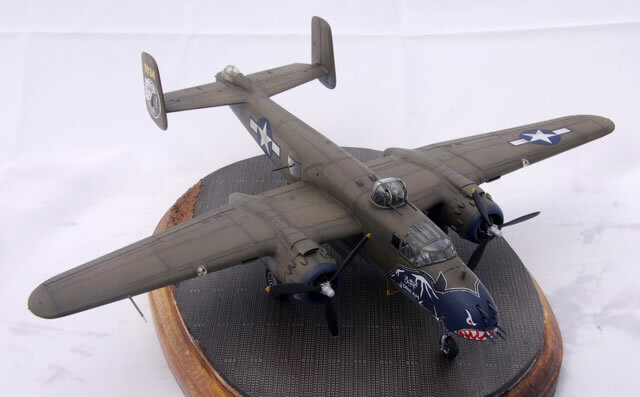 A couple of years later Revell-Germany re-released the Hasegawa B-25J solid-nose strafer kit in their own box which could be found here in the states for under $30. While I’m normally a quarter-scale guy, I couldn’t resist the allure of the beautiful Hasegawa Mitchell. AMS quickly overcame common sense and I added the Eduard Big-Ed set of photoetch as well as a few Quickboost resin parts to spruce it up, particularly the engines, cowlings and props. The Eduard set spruced up the cockpit with new seats, instrument panel, rudder pedals up front and in the back a new radio rack, ammo belts and fuselage floor, unfortunately not much of it is visible on the completed model. The Eduard bomb bay set adds a great deal to the interior of the plane, such that I decided to keep the bomb bay doors open. Once finished, I was even hesitant to put bombs on the racks that might obscure all of the lovely Eduard parts. 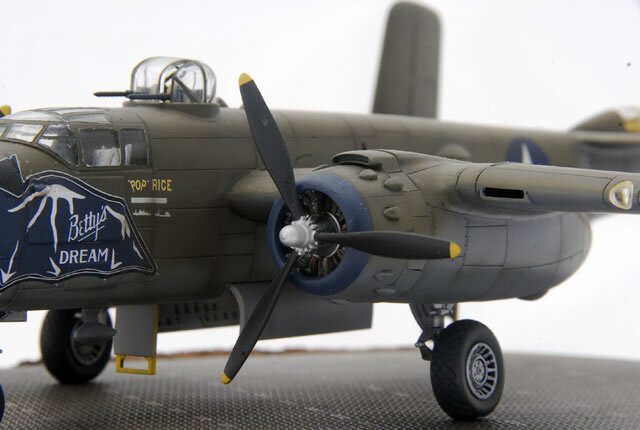 I painted the interior to match up with B-25J production standards which had a dull dark green cockpit and aluminum for the bomb bay and the aft fuselage. 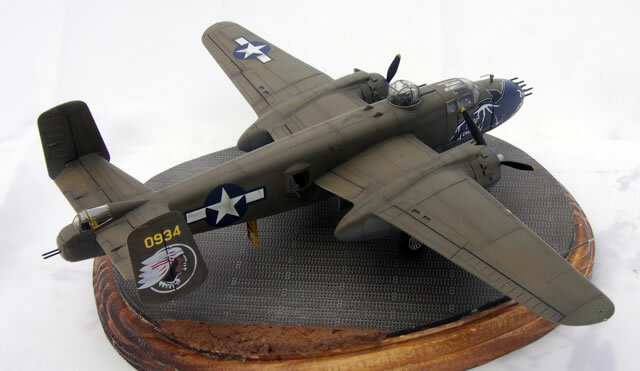 One of the catch-22’s of the Hasegawa B-25 kits is how you handle installing the .50 cal machine guns in the tail, waist and nose. Ideally you would want to install them after painting and decaling to protect them from damage, but the Hasegawa kit design would have you install the guns beforehand. I tried to split the difference by installing the nose, top turret, waist windows and tail guns after I had painted the model. It worked fine everywhere except the nose, which didn’t fit well, with a regrettably large step all the way around that was almost impossible to deal with without damaging the eight fifties sticking out of the front. Don’t forget to put some weight in the nose at some point to prevent the finished Mitchell from sitting on its tail. The wings fit beautifully as did the engines and cowlings. The ignition harness for the R-2600 engines was made out of painted fine lead solder. I wanted to portray an aircraft from the 499th BS which was famous for the large “Bat” markings that adorned the noses of their aircraft. 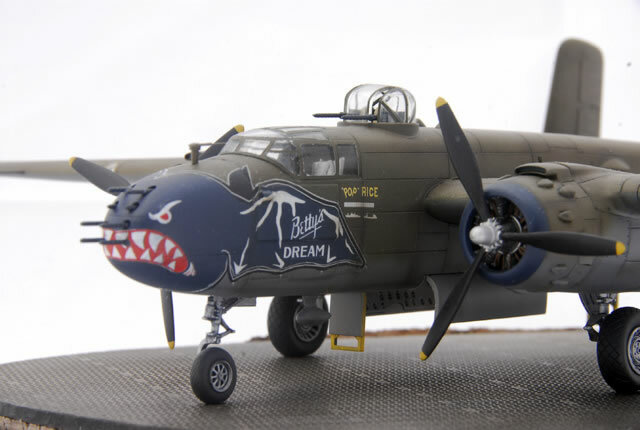 The 499th received its’ first B-25J’s with the factory 8 machine gun noses in early 1945 while they were based in the Philippines, and relatively few factory 8 gun B-25J strafers from the 499th have ever been represented on decal sheets. 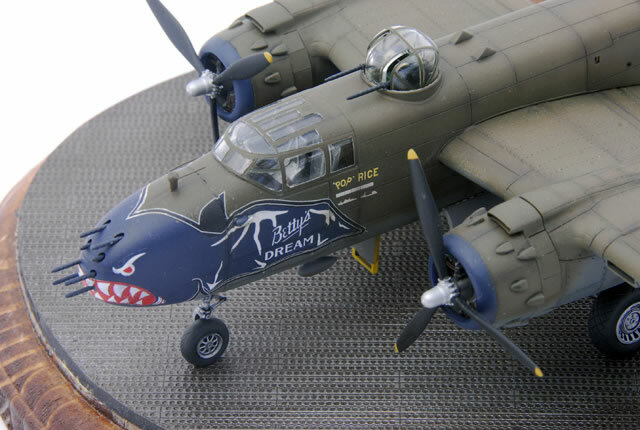 Easily the most famous 499th B-25J was “Betty’s Dream” which was one of the two 345th BG B-25J’s that escorted two white G4M “Betty” bombers carrying Japanese peace envoy’s to the Philippines on August 19, 1945. 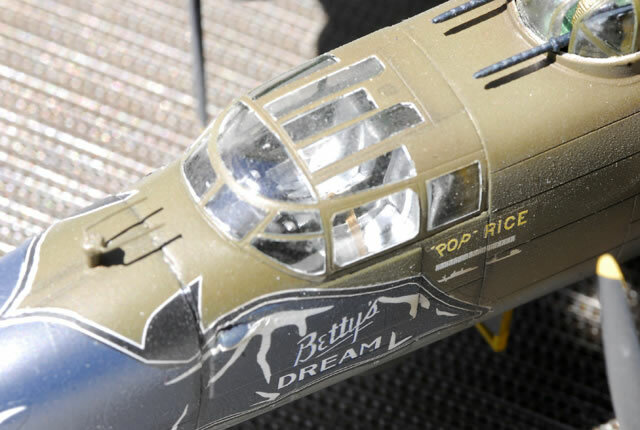 While an early limited edition Hasegawa release of the kit included the markings for “Betty’s Dream” no aftermarket decals exist for the aircraft in 1/72. 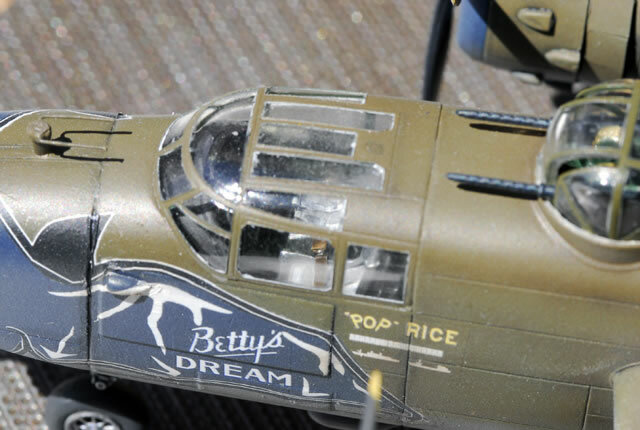 I took up the challenge, using a 1/48 Aeromaster sheet as well as profiles and photographs from Lawrence Hickey’s seminal Warpath Across the Pacific to create custom decal artwork for “Betty’s Dream” in Adobe Illustrator to print on Tango Papa decal film with my ALPS MD5000 printer. There are two ways to print your artwork on an ALPS, the first is to use dithering where the printer uses small dots of color to represent colors and shading much like a newspaper. Unfortunately while the ALPS has the advantage of being able to print solid white as well as some metallic colors, it doesn’t have great pixel resolution so dithering isn’t a great solution. The second method is printing multiple layers of opaque and translucent colors on top of each other until you achieve the correct shade. To print my “Betty’s Dream” art it took about 12 different individual print passes and three cartridge changes to create the six layers in the art (black, white, yellow, blue, brown and red). When you draw the art you do each layer separately like an overlay that you print in order from light to dark until your artwork is complete. When you’re done you protect the finished decal art with a layer of Microscale liquid decal film. 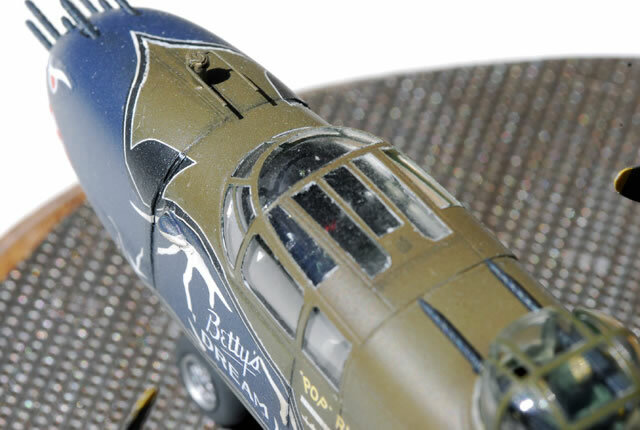 The aircraft was painted OD over Neutral Grey with Aeromaster (Floquil) acrylic paints, with Insignia Blue used for the “Bat” on the nose and cowl rings. I then applied spare aftermarket decals for the four position stars and bars and then the custom ALPS markings. Several applications of MicroSol was used to persuade the border of the “bat” to conform to the double compound curves of the nose. A careful wash of Winsor Newton Payne’s Grey and a bit of light weathering (remember these late J model strafers were delivered late in the war), and a flat clear coat from Alclad and I was in business. The last thing I did was install the transparencies for the waist guns and the top turret, as well as the tail guns. Somehow I managed to get the kit finished without breaking off at least one fifty cal. I felt like I should have bought a lottery ticket.